WinX iPhone Video Converter is our giveaway of the month. 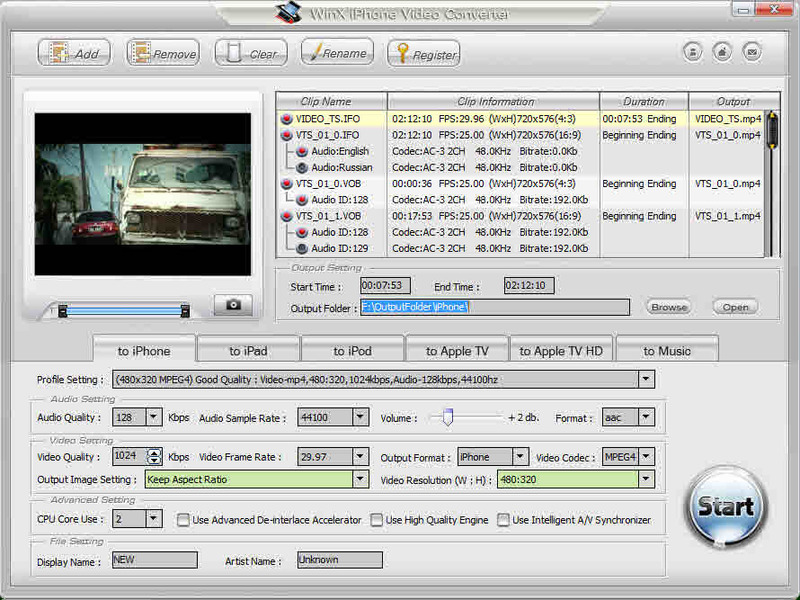 This application can convert AVI WMV MKV to iPhone, iPad, iPod, Apple TV formats. WinX iPhone Video Converter is a user friendly software, whcih can convert a wide range of videos to iPhone. You can convert the videos to any of your iPhone 4/4S, iPhone 3G/3GS with super speed. You can convert regular video formats like AVI, MP4, WMV, MPEG, HD, Etc formats to iPhone. Also you can convert JVC, Sony, Panasonic, Canon camcoder videos to iPhone, iPad, iPod touch, Apple TV and other Apple products which support video. You can even extract audio to MP3 and capture screenshot as BMP, JPEG pictures. 4) Super Fast Converting Speed. 5) Simplicity in Video Conversion. 1) High-tech and prominent features like Fast Speed, Classified Presettings, High Output Quality. 2) High Quality output with unique engine and advanced de-interface accelerator for best video and audio quality. 3) Convert regular video formats to iPhone. 4) Compatible with all Apple devices. 5) Rich video editing features like trimming, splitting, adjust video and audio parameters, set display name , artist name and many more amazing features. You can find more information about the conversion specifications and can download a user guide in the official site. Now, lets get into the giveaway. WinX iPhone Video Converter each key is worth $29.19, with a special offer, it comes for just $19.99 and if you are one among the best 15 users, you can win this WinX iPhone Video Converter key for free. We have 15 WinX iPhone Video Converter License keys for PC (Windows) users and 15 WinX iPhone Video Converter License keys for MAC users. If you want one of these keys, all you have to do is to follow the mentioned steps given below. Step: 1 – Like our Facebook Fan Page and Join our Facebook Group. Step: 3 – Subscribe to our RSS and Leave a comment below with shared links (Step 2) and about the product. If you follow these steps, we will send license keys to 15 best comments and shares. Please drop us a line if you have any further doubts. You can download the WinX iPhone Video Converter software from the exclusive official page given above. Would love to use it and watch videos. Thank you coolpctips for giving such good giveaways.